Liverpool never do things the easy way. They try, but it never happens. Yet the last few weeks have been especially breathless for Liverpool fans. The Reds have just about managed to stick with Manchester City as the Premier League title race approaches its crucial climax. A little over a month of Premier League football remains, with Liverpool at the top of table and with a two-point advantage over Pep Guardiola’s side, but the latter have what could be a vital game in hand. 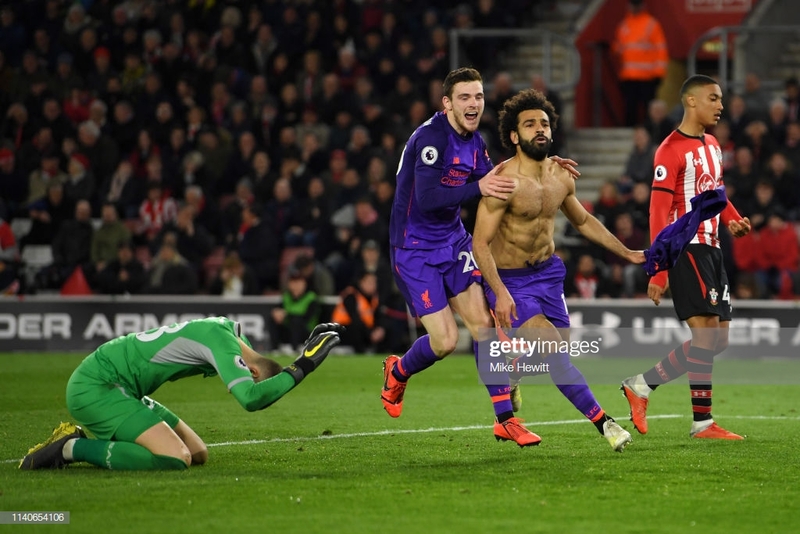 Liverpool are potentially only five matches away from their nineteenth league championship following their latest escape act on the south coast against Southampton, scoring late twice in a 3-1 victory on Friday night. In each of their last four Premier League games, the Reds have either fallen behind or been pegged back by opponents causing serious problems and looking likely to inflict permanent damage on Liverpool’s title chances against a relentless, remorseless Manchester City team. In contrast to City, who have cruised through matches in recent weeks with a momentum of control, authority and purpose, Liverpool have dragged themselves over the line in order to stay on course. As a result, Jürgen Klopp’s team have their own raw momentum, with a feeling that destiny is on their side in this title hunt. No matter who the opponent or the obstacles presented in front of them, these Liverpool players believe they will find their way to three points every time. No team has won more points from losing positions than Liverpool this season, and no team has scored more late goals than Liverpool. They may not be as fashionable or composed as City, but their spirit and desire to go all the way in the title race, against one of the best sides the Premier League has ever seen, remains just as strong as on the opening day of the season. As a result, we have two sides pushing each other to unprecedented heights for a Premier League title race. In the past we have seen one team set such ridiculous standards when strolling to a league title – see Manchester City’s ‘Centurions’ last season for instance. However, never have two sides competed in the same year to such a standard as this, and neither side are receiving the overwhelming credit they deserve for such a transcendent season as this. City are chasing the quadruple of the Premier League, Champions League, FA Cup and League Cup, with the latter already secured, while Liverpool are looking to end a twenty-nine-year wait to win a league title that used to be a formality on Merseyside in the 1970s and 80s. Both have had to deal with immense expectation this season – could City win everything and perform to the standards that they set last season? Could Liverpool build on their run to the Champions League final and sustain a proper title challenge that would not fall away when the pressure was on? Despite the various questions, both City and Liverpool have, for the most part, carried on winning and winning all season long – sometimes in style, sometimes not. Indeed Liverpool could finish on ninety-seven points and still not win the league, which would be devastating but still a testament to how incredible they have been – and how unfortunate they are to be competing against this City side in the same season. City’s squad is probably the best in world football, hence their continuing challenge on three fronts in addition to already winning the League Cup. Liverpool sacrificed any domestic cup ambitions to focus on the big two of the Premier League and Champions League, though if they had the luxury of choosing between the two competitions they would want the former. Liverpool have a winnable quarter-final tie against Portuguese giants Porto to take them into the semi-finals for the second successive year, while Chelsea, Cardiff City, Huddersfield Town, Newcastle United and Wolves await to complete their league campaign. Meanwhile, City’s fixtures appear tougher on paper, drawing Tottenham in the Champions League and with Crystal Palace, Tottenham, Manchester United, Burnley, Leicester City and Brighton still to play in the Premier League. If Liverpool can stay ahead of City at the top of the table when the Manchester Derby takes place at Old Trafford, then the Reds will have a massive chance of ending their long league title wait. Forget City’s perfect performances as they pursue a perfect season – should Liverpool remain perfect in their results for the rest of the league campaign, by any means, then that pressure may mean City’s perfect season becomes Liverpool’s instead.